As I walked my dog around the park on Sunday 6th January 2013, the idea came to me of setting up an online short story writing group, as an extension of critique I used to give on this blog. I also provide a free 1,000-word editing sample as part of my editing service. I’ve also set up a Feedback section on this blog, but that’s just a list of readers / writers willing / offering to provide feedback and they then go off and talk amongst themselves (hopefully!). But I know from my now-weekly Red Pen Critique slot, how useful open critique is to other writers. 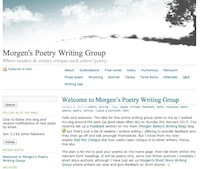 Hence, Morgen’s Online Short Story Writing Group was born, and while I was designing it, Morgen’s Online Poetry Writing Group formed in my brain. The plan was for me to post your stories or poems on the relevant home page then list them within the relevant genre / form headings for readers to enjoy and let you know what they thought (positively / constructively). I also post weekday writing exercises on the four fiction sites. For the short story site, there’s no lower word count limit so if you have a 50-word story you’re burning to share then feel free to send it to me. Because of my existing workload (stupidly busy) I am asking for a 1,000-word upper limit. For the poetry site, there’s no lower line limit so if you have a haiku you’re burning to share then feel free to send it to me. Because of my existing workload (stupidly busy) I am asking for a 100-line upper limit so email me first if your poem goes over that. There’ll be no payment for the stories or poems put on these blogs because it’s all about feedback. They also count as being published so bear this in mind when planning to submit to competitions etc. Each story or poem can carry below it a 250-word max third-person biography of the author, one contact link (e.g. their website), one photograph of themselves (if they wish to include one) and / or a cover of their latest (or favourite) book (if they have one). To submit your stories, see Short Story submissions / Poetry submissions. There’s also Morgen’s Online Novel Writing Group for critique of novel extracts and Morgen’s Online Script Writing Group for script extracts, and Morgen’s Online Non-Fiction Writing Group for non-fiction extracts. Each new posting is advertised on my Facebook, Twitter, LinkedIn, Tumblr and Yahoo profiles so it is a chance for extra traffic to your website too. Writing Tips: where writers / readers leave their favourite writing tips. I monitor comments on all sites, so please leave positive / constructive feedback. Anything spiteful will be removed (or not approved in the first place). Is there anything else that you’d like to see on these blogs? If so, let me know. Thank you for taking part and I hope it proves useful and enjoyable to all concerned. Hello morgen. i,d like to let you know that i think all of this is wonderful. and a very great idea, to have public contact avaible as well. and i really hope i will be joining the crowd soon.